Alberta wildfires will leave toxic legacy, experts warn. 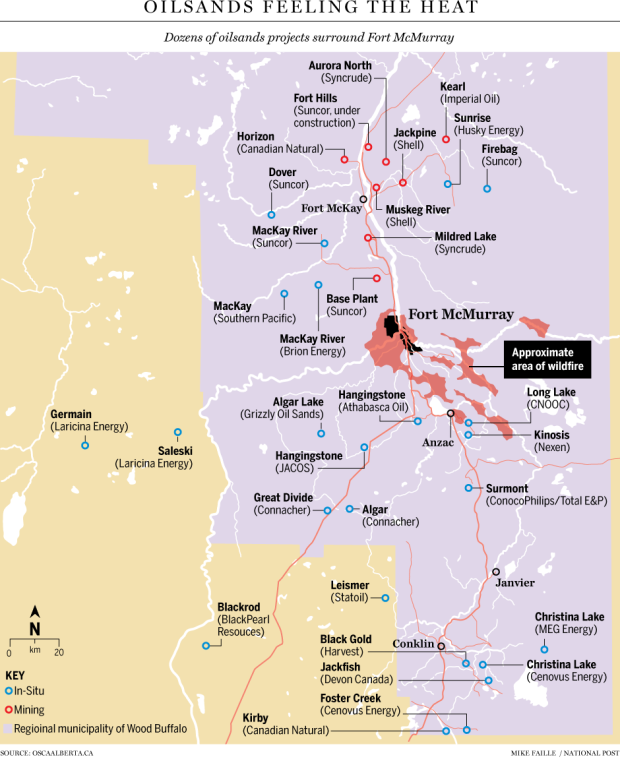 What about the radioactive waste storage site near Ft McMurray? Due to the wildfires in Fort McMurray and surrounding areas, nearly 100,000 people have been displaced and many jobs have been lost. While our thoughts are with everyone who has been affected by this unthinkable disaster, we know that thoughts are not enough to help those impacted. As a company who has previously experienced the impact of a natural disaster, we know that rebuilding a city as quickly as possible in the aftermath is key to ensuring a community’s speedy recovery. If you have lost your job due to the fires, please let us know. It is our priority to help you get back to work and rebuild the community you call home. We need hard working people who are comfortable living in a camp in Fort McMurray to join us in this time of need. Our fellow Albertans need your help, together we can make a difference! We are hiring immediately. To apply, submit your resume (cover letter not required). EDMONTON – Danger from the Fort McMurray wildfire that has destroyed entire city blocks in the northern Alberta city won’t end when the flames stop. “There’s no doubt, it is hazardous,” said Scott Stephens, a fire scientist at the University of California Berkeley. California has sad experience with wildfires raging through urban areas. Every summer, said Stephens, the state loses homes to marauding flames from the woods. Wildfires big and bad enough to force their way into communities are generally hot enough to burn off hydrocarbons such as vinyl siding, nylon carpets or household chemicals. House fires can burn for more than an hour at temperatures reaching 1,500 C, he said. But the ash left behind poses real threats. The U.S. Geological Survey found ash left after California’s home-destroying wildfires in 2007 and 2008 was far more alkaline than ash from wood fires. Mixed with water, the ash was almost as caustic as oven cleaner. It was also significantly contaminated with metals, some of them toxic. Arsenic, lead, antimony, copper, zinc and chromium were all found at levels exceeding Environmental Protection Agency guidelines. Ash particles from urban-wildfire blazes tended to be smaller and more easily inhaled. Both arsenic and hexavalent chromium — a form of the metal known to cause lung cancer — were more readily taken up by lung fluids than they were in water. Many counties treat ash from such fires as hazardous waste, said Geoff Plumlee, a geochemist who conducted much of the U.S. research. Alberta’s last experience with a forest fire destroying homes came in Slave Lake, where more than 400 homes and other buildings were levelled in 2011 — about one-quarter as many as were burned in Fort McMurray. The ash from that fire was disposed of as hazardous waste. Tests of the ash found lead, a powerful neurotoxin especially dangerous to children, was at three times the recommended levels for residential soils. Dioxins and furans, some of which are highly potent carcinogens, were anywhere from 13 to 52 times the guideline levels. Government officials argued the ash shouldn’t be held to the same standards as soil and said the ash was not a health risk. But scientists at the time questioned that assessment. Plumlee emphasized that risks are manageable and fade over time. Ash quickly becomes less caustic when it mixes with small amounts of carbonic acid in rainfall. But the risks are real. 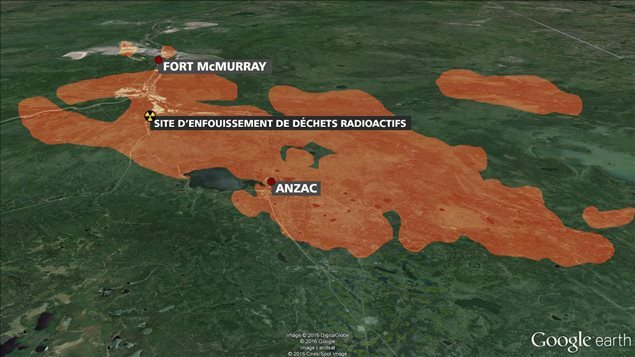 With the massive fires raging in and near Fort McMurray in Northern Alberta, concern has been expressed about the integrity of the historic radioactive wastes stored nearby. The radioactive ore and/or concentrates were carried by Sahtu-Dene native men on their backs in burlap sacks and loaded onto a boat called “The Radium Gilbert” that took about 8 hours to cross the lake to the river near the present-day site of Deline. The ore-carriers would often lie on the sacks as the boat crossed the lake, then they would carry the sacks off the boat and onto a river barge, where the cargo would be carried south to the railhead near the present-day site of Fort MacMurray. From there it would be either flown or sent by rail to Port Hope. Around the time when Robert Del Tredici and I were invited to Deline to inform the Dene community of the dangers and the ultimate military use of the uranium that was mined at Port Radium, about 1998, a great deal of press and political pressure was generated over what a messy operation it had been. It became clear that the burlap bags sometimes ripped or tore open, showering the ore carriers with radium-bearing material that they were never told could be dangerous. There were no facilities for showering or changing clothes, nor any instructions for the workers to wash thoroughly to remove the radioactive materials from skin and hair. In the subsequent years, following the adverse publicity, the Low Level Radioactive Waste Management Office (LLRWMO) was formed within the ranks of AECL (Atomic Energy of Canada Limited). Investigation revealed extensive contamination of docks and soil and buildings all along the Northern Transportation Route. Much of the contaminated material — at least the material that was on the surface and easily collected — was packaged and transported to the Fort McMurray area where it has been stored right up to the present time. The map below shows where the radioactive material is stored. From the early 1930s to the 1950s, uranium ore was transported over 2,200 km by the Northern Transportation Route (NTR) from Port Radium (on Great Bear Lake, Northwest Territories) to the railhead at Waterways (now Fort McMurray, Alberta). In the 1990s, AECL’s Low-Level Radioactive Waste Management Office (LLRWMO) identified sites impacted by uranium ore along the NTR. The contamination was located primarily in docks and boat launches. Radiological surveys conducted in 2004, 2005 and 2006 determined the volume of the waste to be approximately 10,000 cubic metres. Following these surveys the LLRWMO removed and consolidated most of the higher-density, uranium-impacted soil from the identified locations. CNL’s LLRWMO is in charge of continuing to address the historic nuclear waste in Canada’s north. It is adapting methods of community engagement and technical approaches that have led to successful remediation projects in Canada’s southern regions.